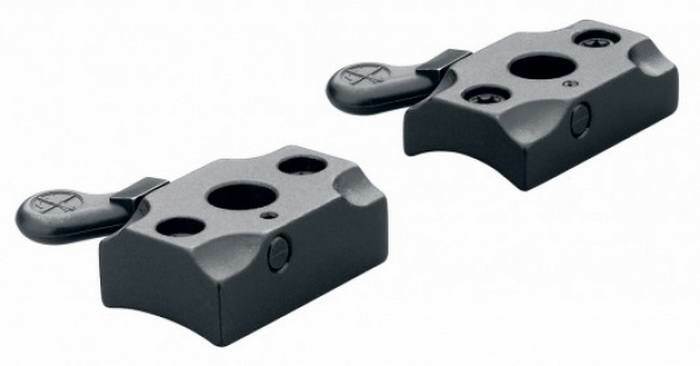 База Leupold QR Steyr/Mannlicher Classic, 2-pc, матовая, 60656 - обеспечивает возможность быстрого монтажа/демонтажа оптического прицела с постоянной высокой точностью. This Leupold Quick Release Base (60656) is also used in 100-yard firing tests at the Leupold plant in Oregon, They repeatedly removed and reattached a scope using their Quick Release Mount, and each time they fired, the scope returned to within half an inch of the original point-of-impact on the target. Super-close machining tolerances are at the heart of this patented lever mechanism. By turning the lever forward, an eccentric on the lever shaft engages the base of the ring. This pulls the ring down and forward on the base, locking it solidly into its zero position.